Liza and Michael d'Hemecourt are speakng out on Question 3 to show support for their daughter Michaela (right), who was born a boy. With an ice cream truck, bounce houses, and more than 200 neighbors gathered on their tidy Needham street, Michael and Liza d’Hemecourt’s block party might have looked like any other over-the-top family fun fest. But their September event was a fund-raiser for transgender rights, generating nearly $20,000 for the campaign to preserve the state’s 2016 antidiscrimination law with a “Yes on 3” vote on Tuesday’s ballot. Graphic: How well do you know Question 3? 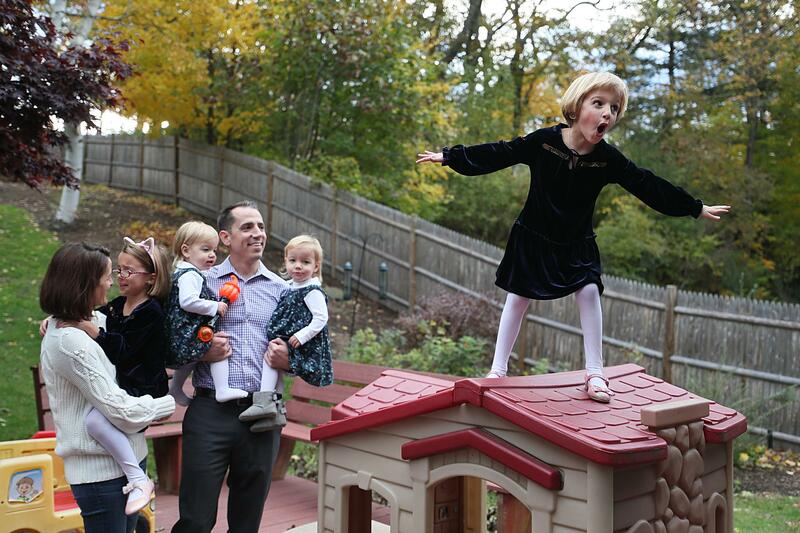 The d’Hemecourts, observant Catholics from conservative families, who met at Boston College and now have four children under 6, may seem like unlikely LGBTQ activists. But their only son began declaring himself a girl before turning 4 — with such consistency and conviction that they could not pretend it was a phase — and on Tuesday, Massachusetts voters could restrict transgender people’s rights in public places. They knew they had to speak up for their daughter. Michaela d’Hemecourt, 5, began declaring herself a girl before she turned 4. Her parents said their primary focus is making her feel accepted while she’s still young. To the d’Hemecourts, the vote on Question 3 is all about protecting Michaela, their 5-year-old whose insistence of girlhood was preoccupying and intense. But protecting children is central to the message on the opposing side as well, the activists who put the question on the ballot to repeal the transgender law. To them, the law muddies definitions of gender in once-gendered spaces, giving predators an opening to enter the ladies’ room and endangering women and children. Their campaign videos focus on children: A teenager cowering from a man in the locker room. A bewildered little girl watching a man put on lipstick at the mirror beside her in the bathroom. A mother saying a boy changed in her daughter’s locker room. “Our children deserve the right to privacy,” the mother, Gina, says in the ad. She was not willing to do an interview, said campaign spokeswoman Yvette Ollada. If, as opponents urge, residents vote “No on 3” and repeal the law, many of those who would lose protection are children. 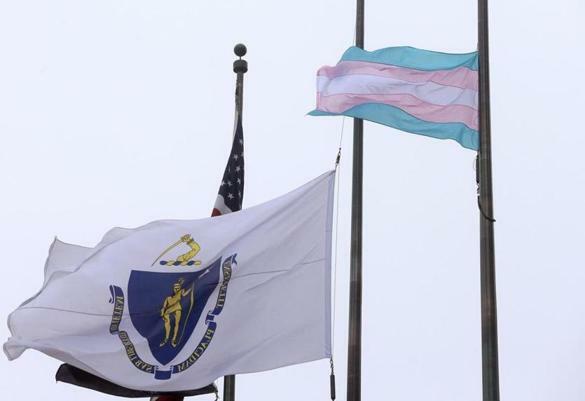 About 2 percent of Massachusetts high school students are transgender, according to the state’s most recent Youth Risk Behavior Survey, which polls thousands of students from randomly selected public schools. Though data are not available for younger children, parents and educators report an increasing number of children transitioning when they’re in elementary school. 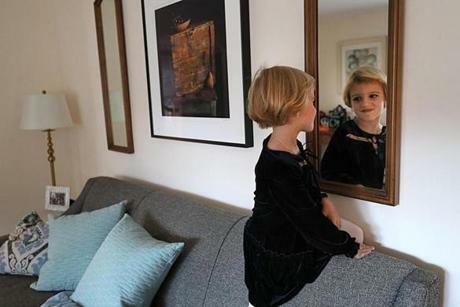 Many parents of transgender youth are pushing back against those recommendations, saying that doctors, parents, and society at large should be more skeptical about the rush to accept and affirm new gender identities for small children. But the academy pointed to the health risks faced by transgender young people — high rates of depression, anxiety, eating disorders, substance use, self-harm, and suicide. Those who have their families’ support are more likely to experience better physical and mental health, the academy concluded. Five-year-old Michaela, who recently came out as transgender, with her father Michael, mother Liza, and one of her three sisters. Her husband, who works in retail real estate, said the opposition campaign had turned the public protection argument on its head. The law was enacted to protect vulnerable people from bullying and discrimination in public places. The law covers places of public accommodation — everything from movie theaters and shops to banks and hospitals -- but not Massachusetts schools. Transgender students are protected in school under a separate law, which went into effect in 2012, and which was followed by guidance from the state Department of Elementary and Secondary Education calling for schools to let transgender students use the bathroom where they feel most comfortable. Transgender and cisgender (people who identify with the gender they were assigned at birth) students have been sharing bathrooms with little consequence in Massachusetts schools ever since. Jacqueline Reis, a spokeswoman for the state Department of Elementary and Secondary Education, concurred. Activists who pushed Question 3 may target schools in the future, however. Already this campaign cycle, some of their organizations are asking legislative candidates seeking election support whether they would repeal the law for schools. Vanessa Ford, 39, of the North Shore, said that transgender children could be turned away from many of the places they go after school. One day after school last week, she planned to take her children to buy the finishing touches for their Halloween costumes; join a community parade; stop in a corner store; and meet a friend at a park. Without legal support, she said, her 7-year-old transgender daughter could be turned away from any of those places. “It’s a very scary proposition if you know there’s no law to protect you and you can legally be discriminated against,” said Ford. Unlike the d’Hemecourt family, who were raising their children in traditional pink-and-blue gender lanes, Vanessa and J.R. Ford had been fashion-flexible with their two sons, born 17 months apart. The first, Ronnie, was charmed by girlish things when he was 4. He did ballet. He painted his nails. He professed his love for the color purple. They let Ronnie paint his nails until he completely lost interest. But his younger sibling — who had always resisted certain clothes — began to fixate on princess dresses and nightgowns, pulling them over clothes and even snowsuits. The Fords even arranged a hybrid fourth birthday party — combining Lightning McQueen and Elsa character themes — and by the end of the party, when Ford wished her “favorite princess boy” a happy birthday, the news burst out. 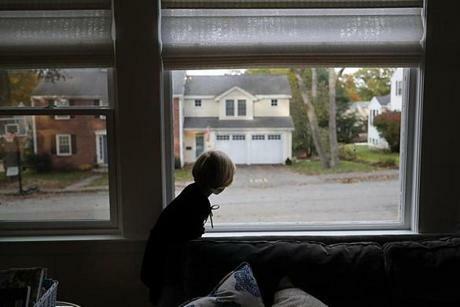 Some questioned whether the Fords were doing the right thing, letting a 4-year-old dictate her gender. What if this was only a phase? “Maybe she’s doing this because you’re giving her dresses,” Ford recalled people saying. But over time, she said, her introverted child began gaining confidence, as she became a rambunctious, rough-and-tumble girl named Ellie. “It was like a cork popped out of what we thought was our son and our daughter flew out,” Ford said. Young transgender children — still far removed from the social pressures and sexual confusion of adolescence — may be more readily accepted than older children, their parents acknowledge. Still their parents worry about how they will weather the implications of Tuesday’s vote. Even if the law stands, some members of their community will have voted against their rights. Michaela d'Hemecourt looked out a window.